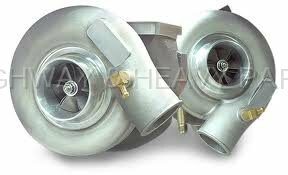 Turbo chargers are a key component of a diesel truck. Turbos produce higher power outputs and improve the efficiency of the engine, not to mention they are extremely exhilarating! They are constantly put to work when your truck is running, so it is important to make sure your turbos are running smoothly and effectively to make your engine last longer. These easy tips can help you save your diesel turbocharger and make it last. First, it is important to have clean oil going through your turbocharger, just like the rest of your engine. It is obviously important to change your oil to protect your engine. However, dirty oil will harm a turbocharger faster than any other part of the engine. This is primarily because they can spin as fast as 112,000 rpm, and engine oil is the only thing that keeps the turbo charger lubricated. The oil is the only thing that prevents metal on metal contact. Metal on metal contact could create huge problems inside your turbochargers, so it is important to regularly change your oil to make sure your diesel truck is running smoothly. Along with clean oil, it is important to have clean air filters as well. A clean air filter will help you maintain a clean engine and prevent soot and other debris from becoming a large issue within the engine. Remember to change your oil and replace your air filters to not only save your turbo charger, but the engine of your diesel truck as well. When you are driving your diesel tractor trailer it is important to realize stomping on the throttle can be quite taxing on your turbocharger. This will make it work harder and wear it out faster than it should be. Try to avoid having a lead foot, try to slowly accelerate to get the truck up to speed. This will help the turbochargers on your truck work better, last longer, and stay healthy. Cleaning your turbocharger will also be extremely helpful. Soot and carbon can build up in your turbocharger potentially causing the turbocharger to stick and produce an erratic performance. This is a major problem that can permanently harm your diesel turbocharger. So how do you clean your turbocharger? Well, there are a few products that are currently on the market that are sprayed through the air intake, and will lock onto soot particles and break them down to keep you turbo charger running smoothly. These are great products to keep your turbocharger running for a long time. Turbochargers are a key part to the diesel engine, and it is important to keep them up and running efficiently. Clean oil, clean filters, and having a light foot will greatly enhance the life of your diesel turbocharger. Remember that turbochargers are sensitive pieces of equipment and need to be taken care of.